Total information regarding the FACT Field Assistant Recruitment 2019 Notification is given in this article. Moreover, the higher authorities of Fertilizers and Chemicals Travancore Limited (FACT) are recruiting the capable, talented, suitable, and eligible candidates for the Field Assistant posts. For that purpose, the officials are conducting this Interview as in the walk-in process. Applicants who are interested they can attend the Interview on 26th, 27th March 2019, 9th, 11th, 17th April 2019. In the below sections, aspirants can also get more information on post-wise vacancies, educational qualification, age limit, selection process, salary details, application fee, important dates, and set of instructions to download and apply for the FACT Field Assistant Recruitment 2019. In the below sections, candidates will get data such as organization name, the name of the post, number of vacancies in the organization, advertisement number, interview date. And also the category, mode of application, selection process, job location, and official site. In the below sections, candidates will get the data on Post-Wise Vacancies For fact.co.in Jobs 2019 according to state wise and with their count. Before applying for the FACT Field Assistant Recruitment 2019, candidates must and should have to view the information on Educational Qualification For Fertilizers and Chemicals Travancore Limited Notification 2019 for the Field Assistant Posts. Applications are invited from eligible candidates with Graduation in any discipline for engagement on contract basis for a period of three months to function as Field Assistant for following up PoS sales in various dealer points and facilitating the pending sales through PoS. 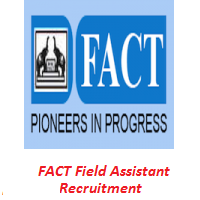 Candidates must and should satisfy the Age Limit which was given by the higher officials of Fertilizers and Chemicals Travancore Limited (FACT) to apply for the FACT Field Assistant Recruitment 2019. To get entered into the उर्वरक और रसायन त्रावणकोर लिमिटेड organization, candidates have to attend the Selection Process For Fertilizers and Chemicals Travancore Limited vacancies 2019 of the Field Assistant Posts. It is one of the important perspectives in the FACT Field Assistant Recruitment 2019. The higher officials of Fertilizers and Chemicals Travancore Limited (FACT) will give the salary for the candidates who had got selected in the FACT Field Assistant Recruitment 2019. The pay will be given monthly as per the rules and regulations of the FACT organization. Field Assistant: Consolidated pay of Rs. 18,000/- per month and Traveling Allowance. First of all, candidates can visit the official site of Fertilizers and Chemicals Travancore Limited (FACT) that is fact.co.in. In that go to the Careers section. Again go to the Job Openings section. Search for the blue blinking link of FACT Field Assistant Recruitment 2019. Read and download the FACT Field Assistant Recruitment 2019 Notification. If you are eligible, then take the application in the given proforma. Fill the details in your own handwriting. Take that application form while you are entering the interview. Our team Sarkari Naukri had arranged the accurate information on FACT Field Assistant Recruitment 2019 which are very beneficial for the candidates. From our site, you will get more stuff such as bank jobs, railway jobs, timetables, syllabus, previous papers, results, admit cards, and latest recruitment notifications of state and central government jobs. Candidates can feel free to ask the queries by commenting us in the below decision box. Thank You.